Open a bottle of wine with a shoe, phonebook or a tree. Open a beer bottle with a dollar bill, one hand, a CD, or a piece of paper. Here's a 5 bedroom, 5 bathroom, 3,000 square foot house in Flint, Michigan for $74,900. With a 20% down payment, and a 30-year mortgage at the current rate of 5.13%, the monthly payments would be $326.44 (principal and interest). It was built in 1928 and last sold in 2001 for $225,000. "If you are insured, under-insured, or uninsured, we can see you for any medical issue. Lack of insurance should not be a barrier to quality care. Our fees are reasonable and we ask for payment at the time of service with a valid credit or debit card (Visa, MasterCard or Discover). We do not work with insurance companies, since their cost structure, rules and mandates can sometimes get in the way of a caring physician-patient relationship. Our overhead costs are kept low by not filing and tracking insurance claims, and we pass those savings on to you. You will receive a copy of the day’s note and a receipt which you may send to your insurance company to apply the charges toward your deductible." Here's the price list, with office visits starting at $36 for one problem and $54 for two problems, a complete physical for $110, and house calls starting at $90. Read a profile here in today's StarTribune. MP: This approach sounds a lot more promising than 2,000 pages of government healthcare "reform," doesn't it? We had 6 inches of snow in DC yesterday and I took this picture today in the Adams Morgan neighborhood. Yesterday I saw at least five cars like this in Adams Morgan during the snowstorm, and I think it's a trend in other parts of the country as well. Growing up in Minneapolis-St. Paul, which gets probably the coldest weather and most snow of any major city in the U.S. in most years, I don't ever remember seeing this, and Minnesota is the one place where dealing with cold weather is elevated to a sophisticated science. Because of the harsh winters, most Minnesotans develop a high level of expertise when it comes to dealing with cold-weather car starting (tank heaters, starting spray), driving in snow, getting cars un-stuck from deep snow, etc. If lifting wiper blades off the windshield was such a great idea, why weren't Minnesotans doing it decades ago? Here is some discussion on this topic, which mostly suggests that drivers are trying to prevent their wipers from getting stuck to the windshield, especially when getting out of a warm car. I don't think I ever experienced that being a big problem, and it somehow seems so unnatural and wrong to me, so I am currently unconvinced that this is a good idea. For those who do have troubles, maybe a better solution would be to simply install heavy-duty winter/snow wiper blades for $7. Comments? "Whatever their backgrounds, their writing problems fit into relatively few categories. Not surprisingly, they have little understanding of grammar and see it as a set of arbitrary “rules” concocted by sadistic pedants harboring grudges against the young. Punctuation is an equally baffling and dangerous area. There exists little understanding of it as a set of signals that facilitate the reader’s comprehension. Vocabulary is weak, perhaps stemming from the legions of teachers since elementary school who have feared above all that their students might suffer confusion or dismay. Some are not sure what is done in the classroom—how to behave. They don’t know when or how to take notes. They perennially miss due dates, drift in late, drift out during the break not to return. They sabotage themselves and then seem to expect forgiveness and accommodation from their professors. Someone showing up one day after having been missing for five or six weeks, only vaguely recognized by the professor, will assume that a way can and will be found to bring him up to speed and on track with the rest of the class. Is all this the result of repeatedly being forgiven in the past? I think so. Understanding the rudimentary conventions of research is minimal. Few are aware of what or how to quote from a source, or how and why to credit that source. Knowledge of plagiarism is far from certain, and finally there is the oft-noted paucity of a body of shared knowledge, thereby inhibiting what assumptions a writer can make about a reader. More than ever before, students live in an intellectual world of their own, a personal world where every individual’s baseline is likely to be different from that of most others and coincides with few. Coupled with extremely spotty historical knowledge, the factors outlined here make for a classroom of wide diversity, though not necessarily the “rich” diversity that college catalogues claim for their campuses." The chart above displays refined sugar prices (cents per pound) using monthly data from the USDA (Tables 2 and 5) for: a) U.S. wholesale refined beet sugar price at Midwest markets and b) the world refined sugar price. Due to trade restrictions on imported sugar coming into the U.S. at the world price, the U.S. sugar beet producers have a sweet deal, assisted by their government enablers, who protect them from more efficient foreign sugar growers who can produce cane sugar in Central America, Africa and the Caribbean at half the cost of beet sugar in Minnesota and Michigan. 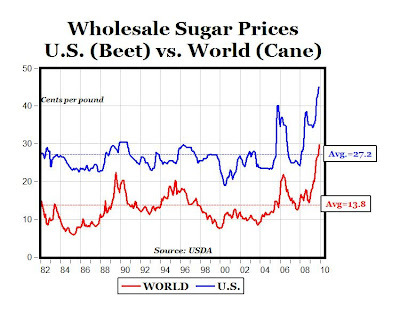 Of course, there's no free lunch, and this sweet trade protection comes at the expense of American consumers and U.S. sugar-using businesses, who have been forced to pay twice the world price of sugar on average since 1982 (27.2 cents for domestic sugar from beets vs. 13.8 cents for sugar from cane, see chart). How much does this trade protection cost Americans? 1. Americans consume about 9.412 million metric tons (20.75 billion pounds) of sugar per year, and therefore every 1 cent increase in sugar prices costs Americans an additional $207 million per year in higher prices. 2. The U.S. produces about 6.9 million metric tons (15.4 billion pounds) of sugar annually, mostly from sugar beets. 3. Due to quotas, Americans are only allowed to import about 2.2 metric tons (4.85 billion pounds) of cane sugar every year, or about 23% of the total sugar consumed. Dec. Restaurant Activity Index Highest Since Feb.
"Driven by improving sales and traffic levels, the National Restaurant Association's comprehensive index of restaurant activity rose sharply in December. The Association's Restaurant Performance Index (RPI) a monthly composite index that tracks the health of and outlook for the U.S. restaurant industry stood at 98.7 in December, up 0.9% from November and its strongest level since February 2008 (see chart above). Despite the solid improvement, the RPI remained below 100 for the 26th consecutive month, which signifies contraction in the index of key industry indicators. 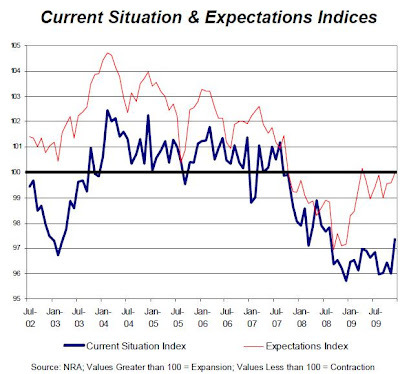 The Expectations Index, which measures restaurant operators' six-month outlook for four industry indicators (same-store sales, employees, capital expenditures and business conditions), stood at 100.0 in December the first time in eight months that the index reached the 100 level (see chart above). Restaurant operators are increasingly optimistic about sales growth in the months ahead. Thirty-five percent of operators expect to have higher sales in six months (compared to the same period in the previous year), up from 31% who reported similarly last month and the highest level in more than two years. In comparison, 21% of operators expect their sales volume in six months to be lower than it was during the same period in the previous year, down from 24% last month. Restaurant operators are also more optimistic about the direction of the economy in the months ahead. Thirty-four percent of restaurant operators said they expect economic conditions to improve in six months, while 18 percent expect economic conditions to worsen during the next six months. Last month, 27 percent of operators said they expected the economy to improve in six months, while 19 percent expected economic conditions to deteriorate." 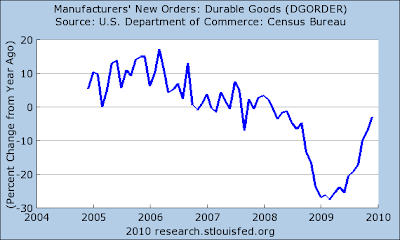 Durable Goods (percent change from year ago). 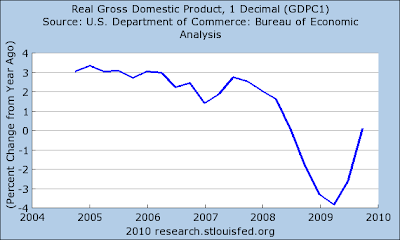 Real GDP growth (percent change from year ago). Here's one more from Scott Grannis (Chicago PMI). Israel is taking bold measures to address its severe organ shortage. With the introduction of two new laws, Israeli families that allow their deceased loved one’s organs to be donated can receive money for a funeral or other memorial, and anyone who agrees to be a posthumous donor gets priority in the event of needing an organ transplant himself. Other countries should follow Israel’s lead and implement initiatives that provide incentives for organ donation. 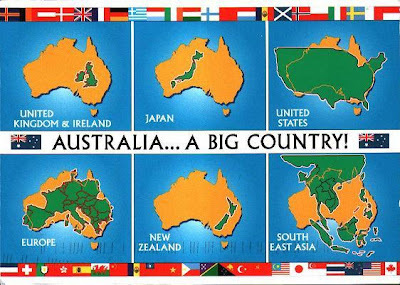 Other countries like...... maybe the United States? We face a huge organ shortage that continues to worsen every year under current policy, which makes it illegal to provide any financial compensation for organ donors. The charts above clearly illustrate the worsening situation for those on the growing waiting list for kidneys in the United States. The top chart shows that at the end of 2009, there were more than 83,000 patients on the waiting list, setting a new record for the total number of candidates waiting for kidneys in any year. Also, the kidney waiting list increased by almost 5,000 in 2009, setting another record for the largest annual increase in history for the kidney waiting list. Kidney transplant operations for 2009 are currently available only through October from the United Network for Organ Sharing, but the projections based on year-to-date counts suggest that about 16,940 kidney transplant operations will take place in 2009. As the graph above shows, the annual number of transplant operations has remained relatively flat at between 16,000 to 17,000 since 2004, while the waiting list has grown by almost 23,000 in the last five years. What that means of course is that the chances for those on the growing waiting list to actually receive a kidney keep fading every year, and more and more people die waiting. 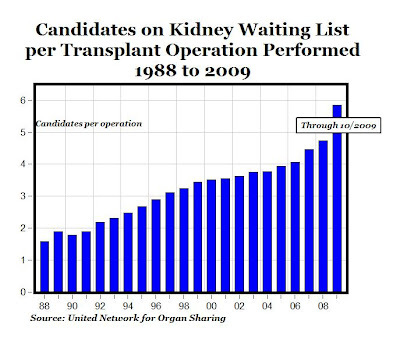 The bottom chart displays the ratio of the number of candidates on the kidney waiting list in a given year to the number of actual kidney transplant operations in that year, and shows the worsening situation for those waiting for a transplant. As recently as 1997, there were three candidates waiting for each kidney transplant operation, but that ratio has almost doubled, to six candidates waiting in 2009 (based on data through October) for every transplant operation. Stated differently, the chances of getting a kidney while on the waiting list have fallen almost in half over the last 12 years, from about a 33 percent chance in 1997 to only a 17 percent chance in 2009. The historical trends clearly demonstrate that current U.S. policies are failing miserably to address the growing kidney shortage, and the situation is getting worse every year. Maybe we can learn something from Israel’s new policies that provide incentives, including “compensation-for-memorialization,” to increase organ donation in the United States. Or how about just allowing direct cash payments? Economics 101 tells us that shortages are always caused by artificially low prices (zero in the case of organs), and can always be eliminated by market pricing ($36,000 is the price that has been proposed in Singapore). Here's what we know for sure: Relying on altruism for organs and a price of $0 results in a huge shortage, with demand exceeding supply by a factor of almost 6:1. At some price, let's say $1 million, there would probably be a huge kidney surplus, with supply exceeding demand. At some market-determined, market-clearing price somewhere between $0 and $1 million per kidney, there would be no surpluses, no shortages, and market equilibrium (Qd = Qs). And that would be the best possible outcome, since it would eliminate the waiting list, and in the process eliminate the needless deaths that now occur at the rate of about 12 per day for kidney candidates. "At age 22, women were more likely than men to be enrolled in college and were more likely to have received a bachelor's degree. Twenty-nine percent of women were attending college during the October when they were age 22, compared with 25.2% of men. 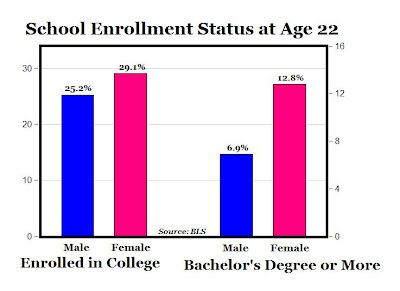 Moreover, 12.8% of women had earned a bachelor's degree, compared with 6.9% of men (bold added, see chart above). 1. This gender degree gap will receive almost no media attention, and certainly no attention from the gender activists. 2. There will be no calls for government studies, or increased government funding to address the problem, and nobody will refer to this gender degree gap as a "crisis." 3. President Obama will not address the issue by signing an Executive Order creating the "White House Council on Men and Boys," like he did for women and girls. 4. Neither Obama nor Congress will address the gender degree gap by invoking the Title IX gender-equity law, like they have considered using for the gender gap in some college math and science programs. 5. Nobody will blame the gender degree gap on structural barriers from grades K-12 that discourage men from attending or graduating from college, like they do for explaining the gender gap for women in math and science. NY Times: "Women make up 46% of the American workforce but hold just 25% of the jobs in engineering, technology and science, according to the National Science Foundation. To Sally K. Ride, a former astronaut, that persistent gender gap is a national crisis that will prove to be deeply detrimental to America’s global competitiveness." Source: Pollster.com. Note that individual dots are individual polls, and the line is the consensus. "It is baffling to see the state of Michigan offer filmmaker Michael Moore a refundable tax credit for his documentary "Capitalism: A Love Story." This subsidy should be rejected by Moore on principle alone. Moore's acceptance of the Michigan film incentive subsidy is troubling because he has grown wealthy railing against corporations and capitalist institutions - such as Wall Street - for enriching themselves at the expense of the little guy and taxpayers. It is against this backdrop that Moore - with his every-man theatrics - asks the taxpayers of Michigan to subsidize his work and by extension his life. He should not. Doing so just smells like a conflict of interest and it makes this award-winning filmmaker appear hypocritical and insensitive to the plight of Michigan's taxpayers." "It should be remembered that diversity creed holds that we are all equal and would be proportionately represented by race across all activities but for the fact of discrimination and oppression." 1. Between 1998 and 2006, the Bidens' adjusted gross income (AGI) averaged $236,000 per year, and their average annual charitable contributions averaged just $283, or only $5.44 per week. That compares to an average annual charitable contribution of $1,916 for taxpayers with AGI between $15,000 and $30,000 (according to IRS data). In other words, taxpayers in one of the lowest income brackets ($15,000 to $30,000) were almost 7 times as generous as the Bidens with only about 10% of their income! 2. The Obamas were a little more generous than the Bidens, giving an average of $2,187 annually ($42.06 per week) between the years of 2000 and 2004, on average AGI per year of $243,000, which means the Obamas were just barely more charitable in their giving than those making less than only $30,000 per year. Adjusted for inflation (in 2009 dollars), Gone with the Wind ranks as the #1 all-time movie for box office receipts at $1.5 billion (released in 1939 when the average ticket price was 23 cents), and Avatar currently ranks a distant #26 at $562 million (so far). Measured by the number of tickets sold, Gone with the Wind also ranks #1 with 202,044,600 tickets, compared to 75,373,800 tickets so far for Avatar. "January 22, 2010 is a day that should live in infamy, at least among believers in limited government. On that day, the federal government added its 2,000th subsidy program for individuals, businesses, or state and local governments. Most people are aware that federal spending is soaring, but the federal government is also increasing the scope of its activities, intervening in many areas that used to be left to state governments, businesses, charities, and individuals. To measure the widening scope, the chart above uses the program count from current and past editions of the Catalog of Federal Domestic Assistance, the official compilation of all federal aid programs, including grants, loans, insurance, scholarships, and other types of benefits. 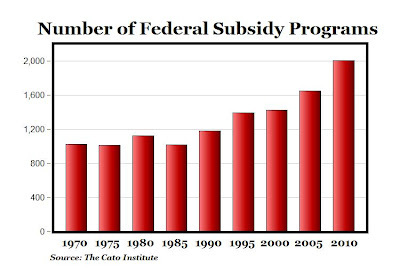 The chart shows that the number of federal subsidy programs has almost doubled since the mid-1980s after some modest cutbacks under President Ronald Reagan." 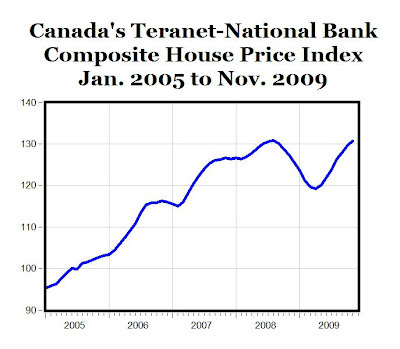 "Canadian home prices in November were up 2.6% from a year earlier, according to the Teranet-National Bank National Composite House Price Index. It was the second consecutive month of prices higher than 12 months earlier, after 10 consecutive months of 12-month deflation. The reason for the turnaround is that November was the seventh straight month in which the index for Canada as a whole was up from the month before, leaving it down only 0.1% from the peak of August 2008." 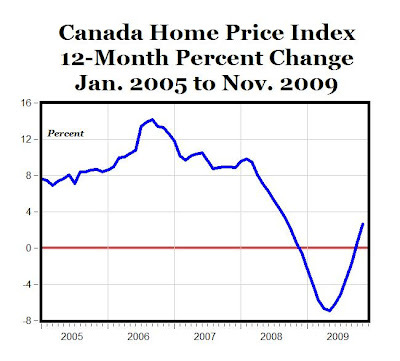 MP: The index for Canada home prices in November was 130.62, just slightly below the August 2008 peak of 130.79, and indicating that there has been a complete recovery for home prices in Canada. 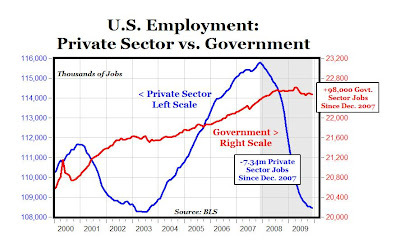 The graph above displays monthly employment levels for the private sector (blue line, left scale, data here) and the government sector (red line, right scale, data here) from January 2000 through December 2009, and shows a pretty bleak job picture for America’s private sector. Since private sector employment peaked at almost 116 million jobs in December 2007 at the onset of the recession, more than seven million private sector jobs have disappeared, while during the same time period government jobs increased by almost 100,000. That is, the entire burden of job losses during the recession has fallen on the private sector, while the public sector has actually expanded and added jobs during the economic downturn. 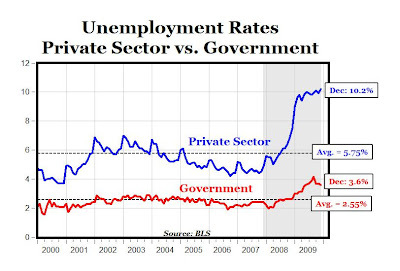 The disproportionate adverse effect of the recession on the private sector can also be seen in differences in jobless rates between the private and public sectors (see chart below). During the Great Recession, the jobless rate for government workers reached 3.6% in December 2009, or only about one percent above its historical average of 2.55%, compared to the increase in the jobless rate for private sector workers to 10.2% in December, or almost 4.5 percentage points above its historical average of 5.75%. What about the $862 billion stimulus package that Obama claimed recently had already “created or saved 640,000 jobs," and would eventually save or create 3.5 million jobs in total? The employment data show that the $862 billion stimulus has yet to create a single new job in the private sector - there hasn’t been a monthly gain in private sector employment for the last 24 months. In tonight's State of the Union address, look for President Obama to make more promises to create jobs for Americans. The fact that $862 billion in stimulus money hasn’t yet created a single private sector job and has added fewer than 100,000 public sector jobs should make us very skeptical about the government’s ability to create jobs. Despite all of the political rhetoric about “saving or creating” millions of jobs, the labor market statistics suggest a much different, and much more depressing story, especially about private sector jobs. Update: Jeff Jacoby's column "Income Angst? 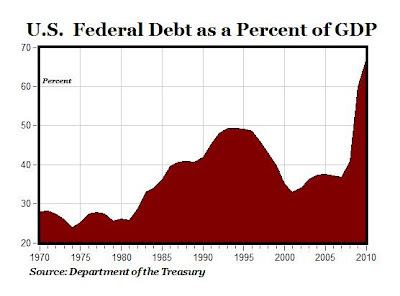 Not for Public Employees"
"His grandiose legislative ambition has become the partially free economy's biggest debt problem (see chart below, data here)." "When President Barack Obama delivers his State of the Union address tonight, he should - but won't - report the significant U.S. decline in economic freedom during his first year in the Oval Office. 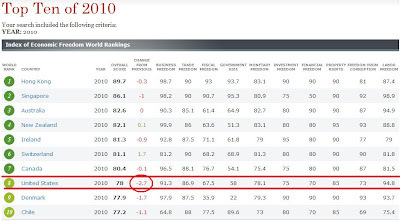 Jointly published last week by the conservative Washington-based Heritage Foundation and The Wall Street Journal, the 2010 Index of Economic Freedom (a 480-page work) strips the United States of its traditional designation as a "free economy," listing it instead - and ranking it as No. 8 in the world - as "partially free." More embarrassing for Mr. Obama, it elevates Canada to the No. 7 spot that the United States surrendered, making Prime Minister Stephen Harper the leader of the economically freest country in the Western Hemisphere (see top ten below, click to enlarge)." "The American Trucking Association's advance seasonally adjusted (SA) Truck Tonnage Index climbed 2.1% in December, following a 2.6% increase in November. The latest gain boosted the SA index from 106.2 in November to 108.4 in December, its highest level since November 2008. 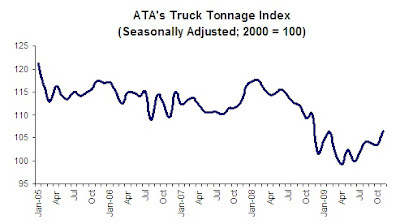 Compared with December 2008, SA tonnage jumped 6.6%, which was the first year-over-year increase since September 2008. For all of 2009, the tonnage index was down 8.3%, which was the largest annual decrease since a 12.3% plunge in 1982. Minneapolis Area Association of Realtors -- "2009 will go down in the history books as the year that the local housing market took large healing steps towards balance. 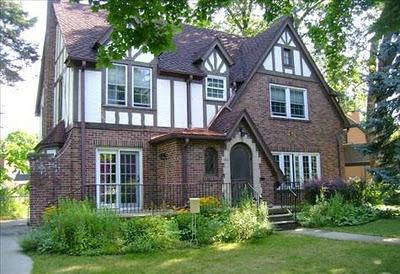 In the Twin Cities 13-county metro area, total pending sales for 2009 ended at 52,167, up a strong 18.4% from 2008. That’s the highest number of units sold since 2005 and the strongest year-over-year increase in sales since 1998." 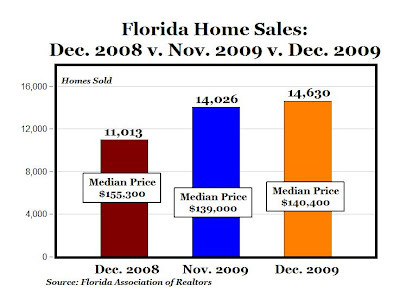 ORLANDO, Fla. (Jan. 25, 2010) – "Florida’s existing home sales rose in December, marking 16 months that sales activity has increased in the year-to-year comparison, according to the Florida Realtors. Existing home sales rose 33% last month with a total of 14,630 homes sold statewide compared to 11,013 homes sold in December 2008. Statewide existing home sales last month increased 4.3% over statewide sales activity in November. Seventeen of Florida’s metropolitan statistical areas (MSAs) reported increased existing home sales and higher condo sales in December. A majority of the state’s MSAs have reported increased sales for 18 consecutive months. Florida’s median sales price for existing homes last month was $140,400; a year ago, it was $155,300 for a 10% decrease, and in November it was $139,000 for a 1% increase." 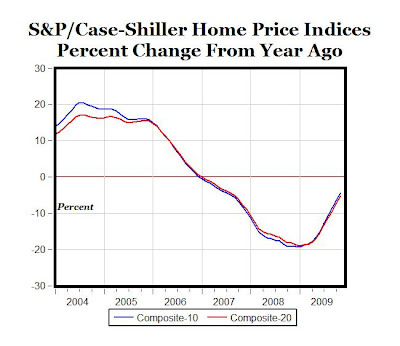 "Data through November 2009, released today by Standard & Poor’s for its S&P/Case-Shiller Home Price Indices, the leading measure of U.S. home prices, show that the annual rates of decline of the 10-City and 20-City Composites continue to improve, in spite of price declines being measured across many markets during November. This marks 10 straight months of improved readings in the annual statistics, beginning in early 2009, and is the third consecutive month these statistics have registered single digit declines, after 20 consecutive months of double digit declines. The chart above depicts the annual returns of the 10-City and 20-City Composite Home Price Indices, declining 4.5% and 5.3%, respectively, in November compared to the same month last year. All 20 metro areas and both Composites showed an improvement in the annual rates of decline with November’s readings compared to October." 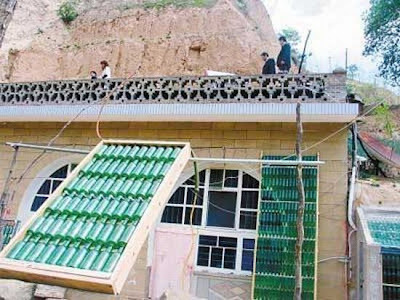 Beer bottle solar water heater. 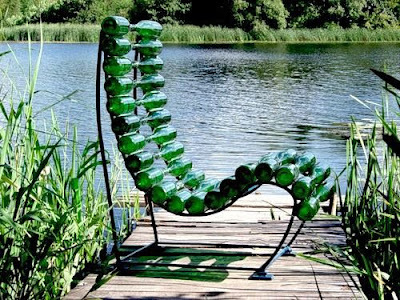 Beer bottle furniture. 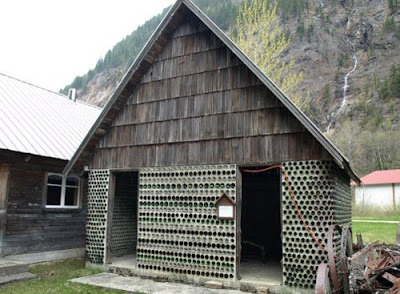 Beer bottle house. More than three-quarters (77%) of American adults claim they "recycle" and slightly less than one-quarter (23%) of American adults "recycle nothing at all," according to a Harris Interactive poll in 2007. GMU economist Don Boudreaux made an important point in his 2002 Freeman article "I Recycle" that even though he and others might be part of the 23% who tell pollsters that they don't officially "recycle," they still do a lot of "unofficial recycling" every day, e.g. re-using many household items like towels, coffee mugs, dishes, utensils, clothes, shoes, appliances, CDs, furniture, and books. Don concludes: "Reflecting on the impressive amount of recycling that actually takes place daily casts doubt on the prevailing misperception that people are naturally wasteful and mindlessly irresponsible. In fact, market prices compel us to recycle when recycling is appropriate—and to not recycle when recycling is inappropriate." 1. Even for the 77% of Americans who claim to regularly "recycle," they usually only recycle a very narrow and limited number of items like newspapers, bottles and cans. Don Boudreaux uses the example of paper plates, and suggests that it would be possible, but too costly, in terms of the time involved compared to the benefits, to re-use paper plates. Therefore, most people, even the most dedicated, religious "recyclers," do not bother to recycle their paper plates. Likewise, there are many other items that even the most committed and devoted "recyclers" don't usually bother to re-use a second time: coffee filters, paper cups, dental floss, paper towels, paper napkins, Q-tips, toothpicks, plastic utensils, and Kleenex tissues. 2. Even when 77% of Americans say they recycle items like newspapers, bottles and cans, what they almost always mean is that they recycle using the "lazy approach," and they actually have somebody else do the actual work of recycling their discarded items (usually after a single use). The "lazy approach" means that instead of actually re-using those items themselves, they put their newspapers, bottles and cans in a special green bin instead of their regular garbage can, and send those items off for somebody else to do the actual, real work of re-using those items. "Recycle newspaper into new paper by tearing it up, soaking it in warm water until it becomes pulp, then spread the pulp on an old window screen covered in a piece of fabric. When it dries, you have great recycled card stock for projects and gifts." 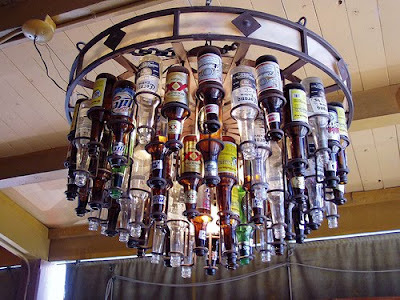 And there are some great ways to be a non-lazy "active recycler" of bottles, for example go here and here to see pictures of the many items that can be made with bottles including light fixtures, Christmas trees, chandeliers, houses, entire temples, and solar water heaters (see photos above). Bottom Line: 1) The 23% of American "non-recyclers" actually do a lot of recycling, especially when the benefits outweigh the costs (clothes, silverware, plates, towels, etc.). 2) The 77% of American "recyclers" are actually most often "lazy recyclers" and don't do their own recycling. Instead, they have somebody else do the recycling for them, and they don't for example use their bottles to make furniture or their newspaper to make paper. 3) The active "recyclers" limit their recycling very narrowly to select items like cans, bottles and newspapers, and even these religious recyclers don't recycle many potentially reusable items like toothpicks and coffee filters. "Therapists looking to study the five stages of grief—denial, anger, bargaining, depression, and acceptance, in that order—need look no further than Washington Democrats struggling to come to grips with the fact that the health care overhaul they spent nearly a year crafting is now dead. Every stage but the last is well represented. The only step left for Democrats is to accept that, after Republican Scott Brown's win in the Massachusetts special election, their signature reform effort is now lost." Hayek vs. Keynes Rap: "Fear the Boom and Bust"
From Econstories.tv: Economist Russ Roberts and filmmaker John Papola's new release, "Fear the Boom and Bust," a rap video about the economic crisis. LA Times -- "Over the last decade, a quiet revolution took root in the nation's second-largest school district. Enrollment is up at charter schools, and overall, standardized test scores outshine those at traditional campuses. Today, Los Angeles is home to more than 160 charter schools, far more than any other U.S. city. Charter enrollment is up nearly 19% this year from last, while enrollment in traditional L.A. public schools is down. And a once-hostile school board has become increasingly charter-friendly, despite resistance from the teachers union. In September, the board agreed to let charters bid on potentially hundreds of existing campuses and on all 50 of its planned new schools. Charters are taking students not just from traditional public schools but also from private schools. Particularly as the economy has soured, many parents see no reason to pay for school if they believe that a charter might offer a similar education without tuition." Mackinac Center for Public Policy -- "For many parents, public charter schools are seen as an escape from underperforming or unsafe schools. Legislative limits on the growth of charters and subsequent waiting lists force parents to submit their children into a lottery to determine if they'll get to exercise their choice for a better educational option. For these parents, pure chance is their only ticket out of failing schools. Below is a clip of a public charter school lottery in Boston for the Match Charter School. Although it ignores the thousands of students who "lost" the lottery, the video shows what educational opportunity looks like for thousands of parents striving to obtain a better learning environment for their children." In this video, Cato's Dan Mitchell explains why we should be very concerned that a "Tax-and-Spend Interventionist" (Obama), following a "Borrow-and-Spend Interventionist" (Bush), could put America on the road to French-style economic stagnation. Traffic Volume: Largest 6-Month Increase in 5 Yrs. The chart above shows the percent change in U.S. traffic volume through November (from the same month in the previous year), in a report released recently by the Federal Highway Administration (data and report here). 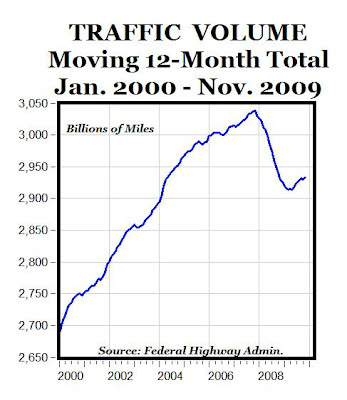 After falling for 17 consecutive months starting in November 2007 and continuing through March 2009, traffic volume has increased in five out of the last six months (see chart above). The cumulative six-month June-November increase of 7.8% is the largest 6-month increase since the 11.6% increase through July 2004, more than five years ago. The chart below displays traffic volume as a moving 12-month total, showing a similar pattern to the percentage monthly increase above. 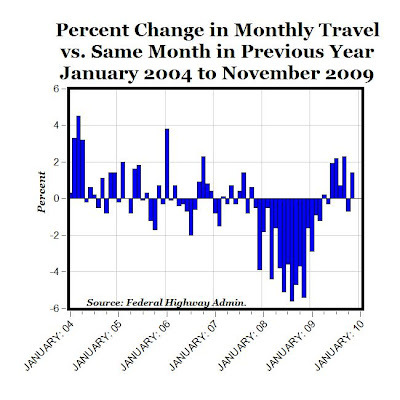 After falling for 16 straight months from December 2007 to March 2009, the moving 12-month total has increased six out of the last eight months, and the June-November increase marks the largest 6-month increase in traffic volume (12-month total) since the summer of 2007. In a related report, "the American Trucking Associations’ Truck Tonnage Index (seasonally adjusted) increased 2.7% in November, following a 0.2% contraction in October. The latest gain boosted the index from 103.6 (2000=100) in October to 106.4, its highest level in a year (see chart below). 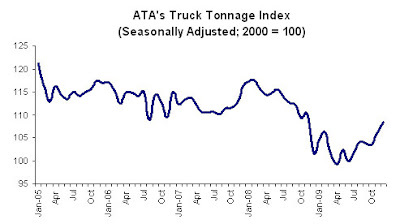 Compared with November 2008, SA tonnage fell 3.5 percent, which was the best year-over-year showing in twelve months. In October, the index was down 5.2 percent from a year earlier." MP: Two more positive signs that a V-shaped economic recovery is underway. Update: Chart below shows that gas prices were generally increasing over the last six months, so the increased traffic volume happened in spite of rising fuel costs. GLOBE AND MAIL -- "In Canada, what some provinces consider standard treatment isn't offered to patients in other parts of the country. Unequal access to cancer drugs – a long-standing issue for patients and oncologists –was to be remedied with the creation of the Joint Oncology Drug Review, to which all provinces but Quebec belong. Despite JODR's formation in March, 2007, the funding of some cancer drugs remains unequal across the country. “Here in Canada, it's still a postal-code lottery for cancer drugs,” said Bill Hryniuk, past chairman of the Cancer Advocacy Coalition of Canada." 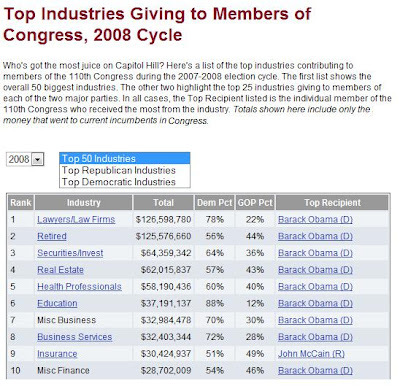 From OpenSecrets.Org, here's a list of the top industries contributing to members of the 111th Congress during the 2009-2010 election cycle (see top ten below). OpenSecrets.Org: "Who's got the most juice on Capitol Hill? 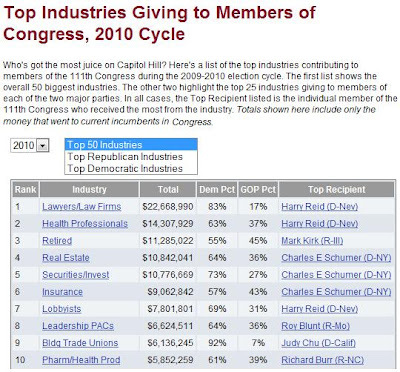 Here's a list of the top industries contributing to members of the 110th Congress during the 2007-2008 election cycle. The first list shows the overall 50 biggest industries (see top 10 below, click to enlarge)." MP: It wasn't even close. From OpenSecrets.org: "In boxing, big punchers seek knockouts. In government, the same principle applies: The wealthiest corporations and special interest groups usually pepper politicians with overwhelming amounts of money in hope of influencing the political process. 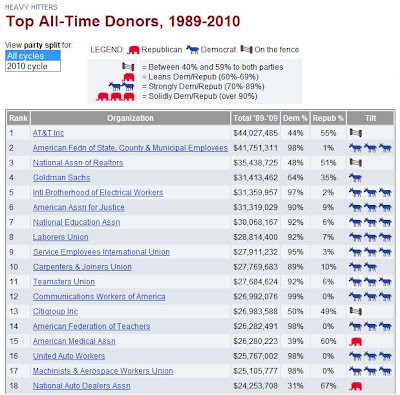 Here you'll find total contributions for the 100 biggest givers in federal-level politics since 1989 -- information that exists nowhere else." MP: Here are the top 18 below (click to enlarge), look at all of the donkeys!! Intrade (last trade = 93%). Wal-Mart: Almost 75% of the Walmart store management team started as hourly associates. From the article "Life at Wal-Mart": Everyone [co-workers at Wal-Mart] agreed that Wal-Mart was preferable to the local Target, where the hourly pay was lower and workers were said to be treated with less respect (an opinion which I was unable to verify). Most of all, my coworkers wanted to avoid those “mom-and-pop” stores beloved by social commentators where, I was told, employees had to deal with quixotic management policies, while lacking the opportunities for promotion that exist in a large corporation. Good Question: Why Can’t IRS Fill in the Blanks? NY Times: "It’s a stunningly reasonable idea. When you prepare your return, why can’t you first download whatever data the Internal Revenue Service has received about you and, if your return is simple, learn what the I.R.S.’s calculation of your taxes would be? You’d have the chance to check whether the information was accurate, correct it as needed and add any pertinent details — that you’re newly married, for example, or have a new child — before sending it. Far better to discover problems early with the I.R.S., whose say matters more than third-party software’s best guess. Requiring taxpayers to file returns without being told what the government already knows makes as much sense “as if Visa sent customers a blank piece of paper, requiring that they assemble their receipts, list their purchases — and pay a fine if they forget one,” said Joseph Bankman, a professor at the Stanford Law School." "Sure, there are playoffs in football, but competition is everywhere, we just forget to notice it. There are eighty million blogs to choose from. Thanks for picking mine to read today. You don't have to like competition in order to understand that it exists. Your fair share isn't going to be yours unless you give the public a reason to pick you." National Enquirer Vindicated - Pulitzer Prize Next? WSJ -- "How the Enquirer Exposed the John Edwards Affair": The former senator might be your attorney general today if our reporters hadn't stuck with the story. Does the National Enquirer Deserve a Pulitzer for Breaking the John Edwards Scandal? · Existing, single-family home sales increased 4% in the month of December to a seasonally adjusted rate of 558,320 units on an annualized basis, from 536,846 in November. 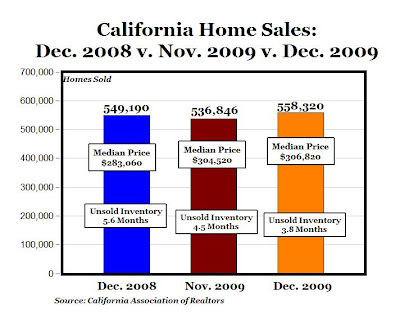 Statewide home resale activity increased 1.7% from the revised 549,190 sales pace recorded in December 2008. · The statewide median price of an existing single-family home increased 0.8% in December to $306,820, compared with November 2009. · For the second consecutive month, California’s median home price rose year-to-year in December, and had the largest year-to-year increase in more than three years. · C.A.R.’s Unsold Inventory Index fell to 3.8 months in December, compared with 5.6 months in December 2008. · The median number of days it took to sell a single-family home was 35.3 days in December 2009, compared with 46.3 days for the same period a year ago. MP: Increasing sales + increasing median home prices + falling unsold inventory + falling median selling time = Real Estate Recovery. The economists Marianne Bertrand (Chicago), Claudia Goldin (Harvard), and Lawrence Katz (Harvard) analyzed the gender wage-gap by analyzing the career outcomes of more than 2,000 male and female MBAs from the University of Chicago. 1. Women have slightly lower GPAs than men and, perhaps more important, they take fewer finance courses. All else being equal, there is a strong correlation between a finance background and career earnings. 2. Over the first fifteen years of their careers, women work fewer hours than men, 52 per week versus 58. Over fifteen years, that six-hour difference adds up to six months’ less experience. 3. Women take more career interruptions than men. After ten years in the workforce, only 10% of male MBAs went for six months or more without working, compared with 40% of female MBAs. "Although male and female MBAs have nearly identical labor incomes at the outset of their career, their earnings soon diverge, with the male annual earnings advantage reaching almost 60 log points at ten to 16 years after MBA completion. We identify three proximate reasons for the large and rising gender gap in earnings: 1) differences in training prior to MBA graduation; 2) differences in career interruptions; and 3) differences in weekly hours. These three determinants can explain the bulk of gender differences in earnings across the years following MBA completion. The presence of children is the main contributor to the lesser job experience, greater career discontinuity and shorter work hours for female MBAs. It appears that many MBA mothers, especially those with well-off spouses, decide to slow down within a few years following their first birth. The pecuniary penalties from shorter hours and any job discontinuity among MBAs are enormous." DQNews -- "An estimated 41,837 new and resale houses and condos were sold statewide last month. 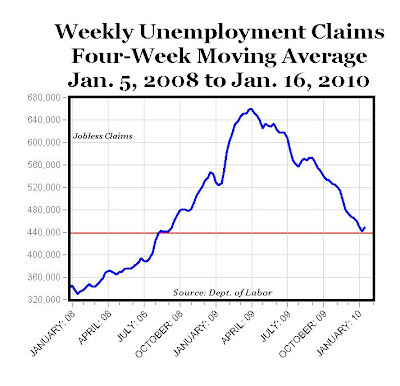 That was up 16.7% from 35,860 in November, and up 10.6% from 37,836 for December 2008 (see chart above). An increase in sales from November to December is normal for the season. The median price paid for a home last month was $264,000, up 1.1% from $261,000 in November, and up 6.0% from $249,000 for December a year ago. The year-over-year increase was the second in a row, following 27 months of year-over-year decline. 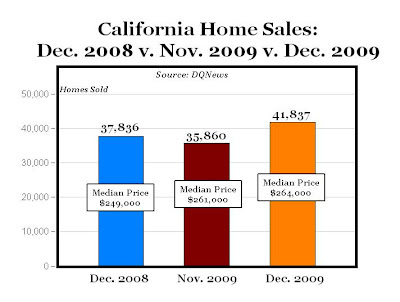 The median peaked at $484,000 in early 2007 and hit a low of $221,000 last April. Of the existing homes sold last month, 41% were properties that had been foreclosed on during the past year. That was up from a revised 40.1% in November and down from 55.2% in December a year ago. It peaked at 58.8% last February." La Jolla, CA---"Southern California home sales in December remained above year-ago levels for the 18th consecutive month, bolstered by gains in many mid- to high-end communities. The median sale price rose year-over-year for the first time since summer 2007, reflecting a more normal distribution of sales across all price categories, a real estate information service reported. The median paid for all Southland houses and condos sold in December was $289,000, up 1.4 percent from $285,000 in November and up 4 percent from $278,000 a year earlier. The last time the median increased year-over-year was in August 2007, when it rose 2.7 percent to $500,000, near its peak." La Jolla, CA.----"The Bay Area housing market last month continued its step-by-step climb up from the bottom with upticks in sales as well as prices. Many of the underlying trends are shifting slowly, if at all, indicating sluggish change in market fundamentals, a real estate information service reported. The median price paid for a Bay Area home was $380,000 in December. That was down 1.8 percent from $387,000 for the month before, and up 15.2 percent from $330,000 for December 2008. Last month was the third in a row with a year-over-year gain, after 22 months of decline. The median hit bottom at $290,000 last March, well off the $665,000 peak reached in June and July of 2007." 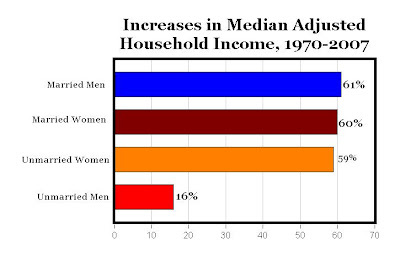 Huge Disparity in Income Gains for Unmarried Women vs. Unmarried Men: The "Single Gap"
USA TODAY -- "If you think women still reap more economic benefit than men do from marriage, you may be living in the past. Today, men are better off economically because their wives are, too, suggests a new study on the economics of marriage by the Pew Research Center. It shows women's education and earnings advancements are translating into overall improvement for men. "Marriage is a different deal than it was 40 years ago," says Pew economist Richard Fry, a co-author of the study. "Typically, most wives did not work, so for economic well-being, marriage penalized guys with more mouths to feed but no extra income. Now most wives work. For guys, the economics of marriage have become much more beneficial." "Every few weeks, it seems, fresh news arrives telling of impressive discoveries of oil and gas in the Gulf of Mexico, an area that, until recently, was viewed as well worked over and unlikely to yield any new bonanzas. Last September brought word of a giant Gulf oil field reeled in by British Petroleum. And the latest Gulf headline-maker is a potentially major gas play offshore Louisiana that appears likely to add new trillions of cubic feet of gas to growing domestic reserves of the cleanest-burning carbon fuel. So much for worked over. The new take on the Gulf is decidedly more optimistic. When coupled with discoveries of huge new reserves of natural gas across Texas, Arkansas and Louisiana, and in Colorado and Pennsylvania and West Virginia, this latest projected Gulf find makes natural gas a truly abundant fuel for this country. In part, gas still suffers from an old misconception, left over from the first energy crisis in the 1970s, that it is scarce and that supplies are expensive and unreliable. This notion is the result of a well-remembered battle to deregulate interstate prices for natural gas. Deregulation came, of course, and the result is the superabundance of gas the nation enjoys today. The other trouble gas has is political — it must contend with the compelling electoral arithmetic that is coal's undisputed advantage. As we saw in the 2008 presidential campaign, the electoral votes in coal-producing states make the environmentally problematic fuel irresistible to national political candidates." •The pressure on wild tigers will go down, attracting more tourists to sanctuaries to see this majestic animal in its natural setting. •The sale of farmed tigers will reduce the incentive for smugglers to kill wild tigers. •Scientists and wildlife managers will improve their breeding, management, and rehabilitation methods for tiger reintroduction; forest dwellers, who have detailed knowledge of their natural surroundings, will facilitate wildlife management. •Rural populations will change their incentives. Villagers who are often lured by smugglers into killing a wild tiger for a few dollars, will now defend their new environmental assets, because a live tiger will be more profitable to them than a dead one. •In addition to attracting tourists through reduced pressure on wildlife, the farms can attract sportsmen through selective allocation of hunting licenses. •As trade and marketing channels develop for both consumptive and non-consumptive use of tigers, investment in better technologies and management practices will take place. National and international brands will appear. Tourism will increase. The price of the tiger in the black market will collapse, and legal trade will thrive. Investment will improve the productivity of wildlife farms, and assured supply and low prices will take the pressure off the wild tigers, allowing their numbers to revive. Nothing would help the tiger and the other resources of our forests more than giving forest dwellers a stake in the resources in their vicinity and the opportunity to make a profit from them. A legal framework for tiger breeding would help resolve the conflict between the people and animals that has contributed to the tiger’s drastic decline. Once people can profit from these resources, they will have the incentive to optimize the use of the resources. It is mostly forgotten that forest and wildlife, including tigers, are renewable. Under such a framework, rather than being in conflict, humans and animals would both prosper. Commerce could be the most powerful ally of conservation." LONDON (Reuters) - "International hotel chain Holiday Inn is offering a trial human bed-warming service at three hotels in Britain this month. If requested, a willing staff-member at two of the chain's London hotels and one in the northern English city of Manchester will dress in an all-in-one fleece sleeper suit before slipping between the sheets. "The new Holiday Inn bed warmers service is a bit like having a giant hot water bottle in your bed," Holiday Inn spokeswoman Jane Bednall said in an emailed statement to Reuters. The bed-warmer is equipped with a thermometer to measure the bed's required temperature of 20 degrees Celsius (68 Fahrenheit). Holiday Inn said the warmer would be fully dressed and leave the bed before the guest occupied it. They could not confirm if the warmer would shower first, but said hair would be covered." WASHINGTON, Jan 21 (Reuters) - "A gauge of the U.S. economy's prospects rose for the ninth straight month to a record high in December, a private research group said on Thursday, indicating a recovery was set to pick up. 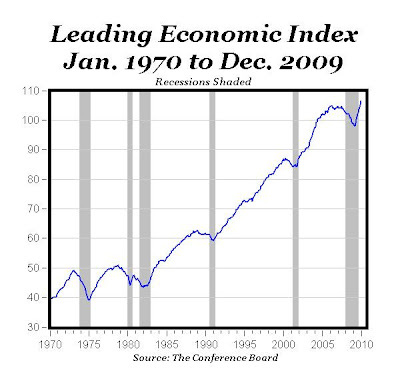 The Conference Board said its index of leading economic indicators rose 1.1 percent to an all-time high of 106.4 last month. Analysts forecast that the index would rise 0.7 percent, according to a poll by Reuters. "The leading economic index suggests that the pace of improvement could pick up this spring," said Ken Goldstein, an economist at the Conference Board." MP: The Leading Index's ninth monthly increase from April to December 2009 is the first time since mid-2004 that the Leading Index has increased that many months in a row. WSJ -- "The number of U.S. workers filing new claims for jobless benefits unexpectedly rose last week -- an increase a U.S. Labor Department economist said is partly due to an administrative backlog in processing claims. Total claims lasting more than one week, meanwhile, declined. The four-week moving average, which aims to smooth volatility in the data, also increased as well last week. The Labor Department said the four-week moving average increased by 7,000 to 448,250 from the previous week's revised average of 441,250 (see chart above). An economist at the U.S. Labor Department Thursday said last week's numbers were higher then expected in part because the Christmas and New Years holidays created a backlog in some states. "It is not an economic thing -- it is an administrative thing," he said." MP: Following nineteen consecutive weekly declines in jobless claims, the 4-week average rose last week for the first since last August. As the Labor Department report suggests, it might be more of an "administrative" factor than any significant reversal of the downward trend since March.